Even if the cat won't let me. 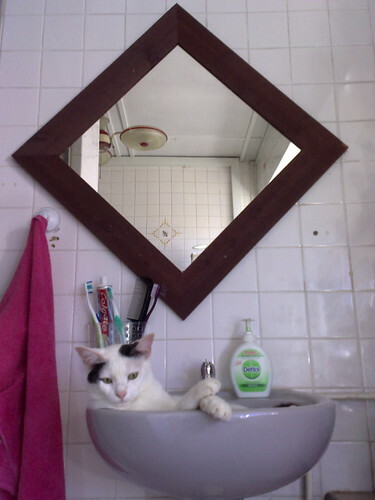 Actually, he got out of the sink after a couple of minutes, so I could perform my morning ablutions after all. My birthday has been hot (where's the unseasonal rain when you need it? ), somewhat work-filled but generally not too bad considering how much dawdling I did. This I document to reassure my brother, whose SMS to me this morning consisted of birthday greeings followed by "Hope the whole day isn't spent doing work." My dad's SMS included a line to say, "Make the world a better place to live in" --- both sweet and guilt-inducing at the same time. I need to dust off certain ideas and get cracking on them. I planned to back up my hard drive --- done. I planned to do a spot of work --- done. I planned to mix various leftovers into a chicken salad for lunch --- done. I didn't plan to finish the Leonidas chocolates oiseauxbleu gave me for Xmas, but there were only two left and I did. Tonight's plans consist of dinner and maybe ice cream or something sweet after. I almost called Awfully Chocolate just now to get myself a whole 6" chocolate cake, but decided I would rather hold out for a real Lana cake when I have time to engineer an order for it. btw - good on ya, waiting for Lana. Save your calories for the good stuff. And I can't believe you haven't finished the Leonidas! Chocs don't last very long in my fridge. In fact I'm on a resupply mission today/tomorrow.